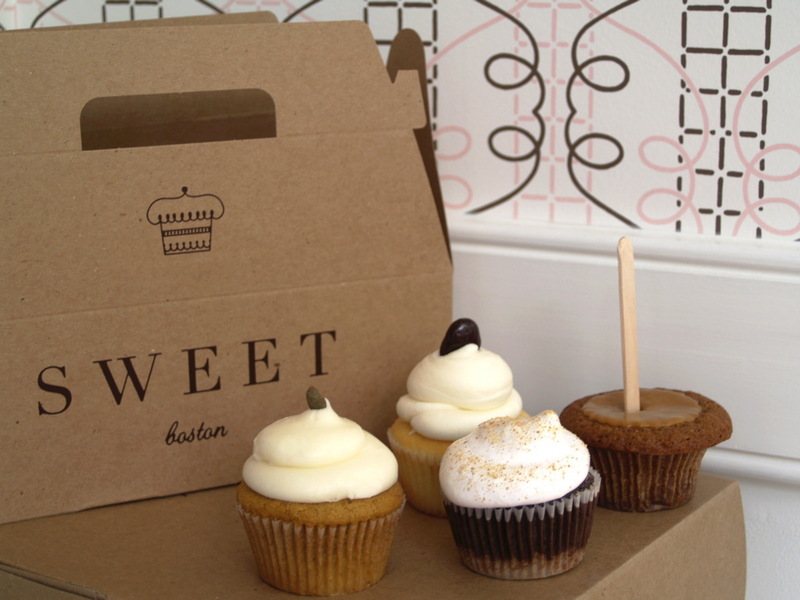 L to R: Pumpkin, Cranberry Orange, S’mores and Caramel Apple. Pumpkin: Fresh, old-fashioned pumpkin cake topped with Sweet’s own fabulous cream cheese frosting, finished with a roasted cinnamon sugar pumpkin seed. Cranberry Orange: The Sweet cake, infused with fresh orange flavor, filled with cranberry preserves and topped with Sweet signature frosting with a hint of orange. Topped with a chocolate-dipped cranberry. S’mores: Our own chocolate cake featuring Bensdorp cocoa with a delectable graham cracker crust, filled and topped with homemade marshmallow cream and dusted with graham cracker crumbs. Caramel Apple: Seasonal apples and autumn spices flavor this fall favorite, dipped in caramel, complete with a stick. I am baking cupcakes for the Ultravolet Cafe in Albany, NY and this month we're featuring Pumpkin Spice cupcakes with cream cheese frosting! I get to Boston every week and will definitely go try their pumpkin cupcakes. the stick in the caramel apple cupcake... brilliant!